The Inaugural Summer Thoroughbred Meet at Los Alamitos was the racing debut of the track's beautiful, new one mile oval. Construction of the track began on Tuesday, December 10, 2013 and was ready for training on Tuesday, January 21, 2014. The construction of the new Los Alamitos oval was overseen by track consultant Dennis Moore, the current track superintendent at Santa Anita and widely considered by many to be the leading track designer and maintenance expert it the country. The racing oval at Los Alamitos features a 100 foot wide final straightaway, a 100 foot wide first turn and an 85 foot wide home turn. The new track features a 1,380 foot homestretch, 34 feet longer than the homestretch at The Fair Grounds, which until now was considered the longest homestretch in American racing. 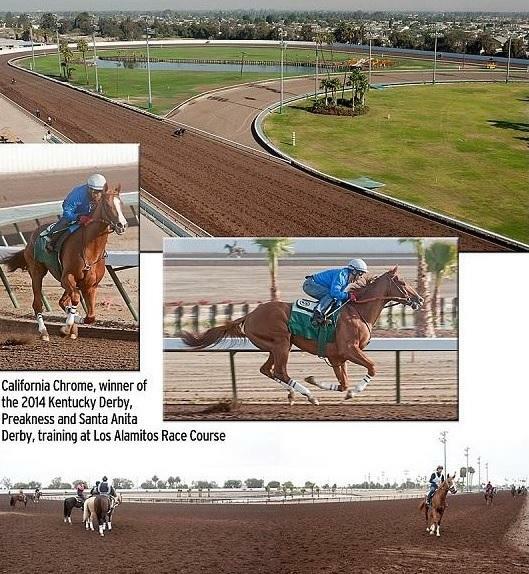 "It is a wide, big racetrack, and it will make for a beautiful track to race on," said Art Sherman, the trainer of 2014 Kentucky Derby and Preakness Stakes winner California Chrome. "I think it's a plus, that surface," added Hall of Fame trainer Bob Baffert. "It's really soft. I send a lot of horses to train at Los Alamitos. It's a big plus." Not a single horse or jockey hit the ground during the 8-day Summer Meeting. The Los Alamitos Thoroughbred Fall Meeting will be held Friday, September 5 through Sunday, September 21. For more info, please call 714-820-2690. Copyright © 2019 Los Alamitos Race Course. All rights reserved.